"I want to say I may have seen my son die this morning." 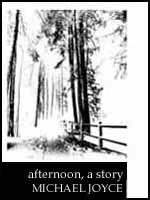 afternoon is a rich and lyrical exploration of the tangled strands of knowing and memory, the interconnections that bind and unravel the intersecting lives of its postmodern characters. afternoon was created using Storyspace. Copyright © 2016 by Eastgate Systems, Inc. All Rights Reserved.